Handicap Accessible seating available, please call the box office to reserve at 877-99-CURVE. Family Section - Section 316 No alcohol permitted. Print your tickets at home and avoid waiting in line! Just select the “:Print at Home” delivery option at the confirmation screen. 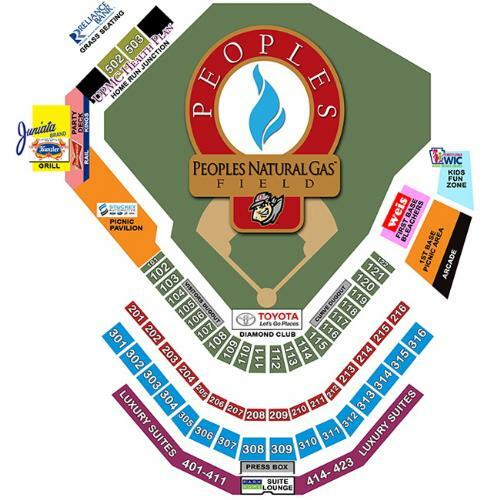 Will Call tickets are available to be picked up at the Altoona Curve Box Office during regular business hours. Tickets are Non-Refundable and cannot be upgraded or exchanged once purchased, unless ticket insurance is purchased for each ticket. Ticket insurance tickets must be exchanged prior to the day of the game. Promotions are subject to change. No food or drink is permitted to be brought into the stadium per Eastern League rules. There is a $1.50 per ticket fee for tickets purchased online and a $2 phone fee per phone transaction. Save money on our individual and day of event prices by purchasing one of our DelGrosso's Flex Books. Each booklet contains 11 ticket vouchers good for any 2019 home game plus a bonus voucher, starting at just $70.